Death Nurse: Cheat sheet - benzos for delirium? A good place to start. But it's just a start. Agitation is not a medical condition. It vaguely describes a level of psychomotor activity. Terms like “confused,” “agitated,” or “restless” can have different meanings to different people, and aren’t useful for clear communication or for making informed clinical decisions. Mistake #1 - not knowing what we’re looking at, and calling it the wrong thing. Saying “agitated” is only appropriate in the context of the term, “agitated delirium,” or when using the Richmond Agitation and Sedation Scale (RASS). I addressed RASS in this post, Bubba’s Dumb Rass; and delirium subtypes in this post, Still More Delirium. RASS is a valuable tool for more clearly identifying someone’s state of consciousness along a ten point continuum, from “deeply sedated” at the lowest, to “combative” at the highest. But it was developed in the critical care setting, and isn’t familiar to most hospice clinicians. Mistake #2 - Using the wrong drug. Mistake #3 - Using the wrong dose. A hospice emergency kit includes 0.5 or 1mg lorazepam tablets. This may be appropriate for reducing anxiety, but is inadequate for sedation. Giving an anxiolytic dose of lorazepam to someone experiencing agitated delirium exacerbates the clinical presentation, because it disinhibits the agitated behavior. Think of it this way - an anxiolytic dose of lorazepam is like a shot of tequila. It might be OK in the right setting, but it’s more likely that a shot or two will lead your mild-mannered friend to start talking too loud, hit on you, or dance on the table with a lampshade on his head. That’s disinhibition. Mistake #4 - Compounding previous mistakes by repeating the anxiolytic dose, sometimes as often as every hour for several hours or more. The median pharmacologic half-life of lorazepam is about 12 hours, so piling on a series of low doses has a much larger cumulative effect - like drinking an entire bottle of tequila one shot at a time. The prevailing theory for the pathophysiology of delirium says it results from a disruption of specific neural pathways caused by an imbalance of the neurotransmitter dopamine. The medical treatment for delirium is based on addressing this imbalance using dopaminergic drugs (drugs that “work with” dopamine), and specifically the class of dopaminergics known as dopamine receptor antagonists. Hospice clinicians should be familiar with five drugs in this class: the first generation, or typical, antipsychotics haloperidol (Haldol) and chlorpromazine (Thorazine); and the second generation, or atypical, antipsychotics olanzepine (Zyprexa), quetiapine (Seroquel), and risperdone (Risperidol). Side Tip: Language matters. Refer to these drugs by their mode of action when talking to patients and families. I’d react negatively if someone told me they wanted to give my loved one an “antipsychotic,” but “dopamine receptor antagonist” sound informed and reassuring. Benzodiazepines and ethyl alcohol affect the brain through entirely different neurotransmitters and pathways, specifically the neurotransmitter gamma-aminobutyric acid, called GABA, and the receptors GABA-A. Nothing about dopamine here. 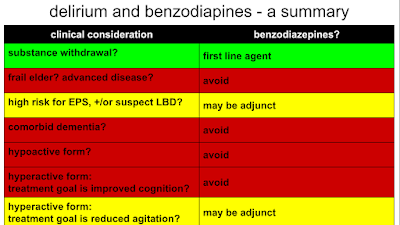 There’s much more to treating delirium effectively than I’m able to cover in this simple chart and limited blog post, such as monitoring for the serious adverse effects of dopamine receptor antagonists called Extrapyramidal Symptoms (EPS), like acute dyskinesias and dystonic reactions, tardive dyskinesia, Parkinsonism, akinesia, akathisia, and neuroleptic malignant syndrome. So, what about the cheat sheet? The first step is to be competent in assessing for delirium. The next is to understand its many causes. The third is knowing what questions to ask. Master those, and the rest falls nicely into place. Is delirium the result of acute withdrawal? Is the person who’s experiencing delirium a frail elder, or someone with advanced disease of any kind? Do they also have dementia? Are they presenting with the hypodelirium subtype? Do the goals of care for someone with agitated delirium include improved cognition or meaningful interaction with family? Is the person with delirium at risk for developing EPS, or do they have Lewy Body Dementia? If so, a benzodiazepine MAY BE A USEFUL ADJUNCT that allows for a lower dose of the dopaminergic. If they have agitated delirium, do the goals for care include substantially calming the behavior and providing uninterrupted sleep? Here again, a benzodiazepine MAY BE A USEFUL ADJUNCT that provides an appropriate level of sedation to support this goal. 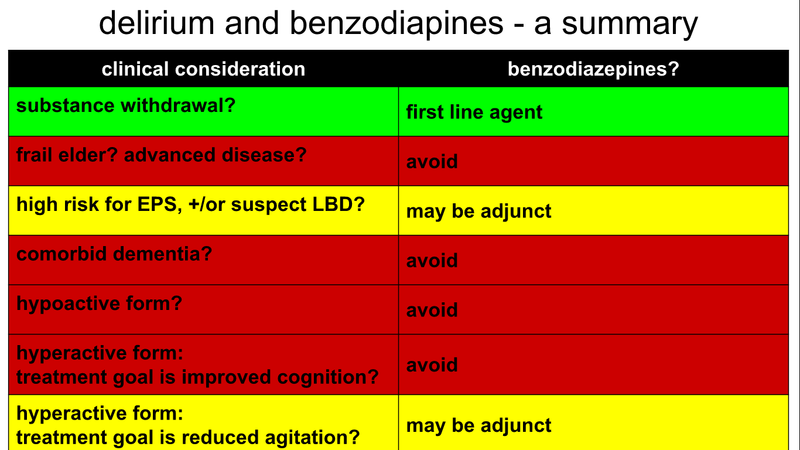 Yellow means a decision to use a benzodiazepine can proceed with “CAUTION!” in particular with regard to dosing. MAY BE A USEFUL ADJUNCT also means it MAY NOT be so. Yeah, it's a pretty basic layout. I need to figure that one out. I try to maintain a M-W-F schedule for posts.